Large Franzen Hasp for briefcases. Step 1 Peel back the organiser section in the lid by about 5 inches. Don't worry about the stitching as it is dummy stitched. Step 2 Peel back the leather that covers the underside of the hasp you wish to replace. Once again don't worry about the stitching. Step 3 You should by now have revealed the back of the rivets that hold the hasp onto the case. Two types of rivet are commonly used. The first type has two legs that can be straightened with a flat headed screwdriver and extracted. The second usually has a washer capping it on the inside which can be carefully drilled out with a cordless drill. Step 4 Put the new hasp on, tapping down the new rivets with a hammer and reverse the process glueing the lining as you go (Evo-stick is best). 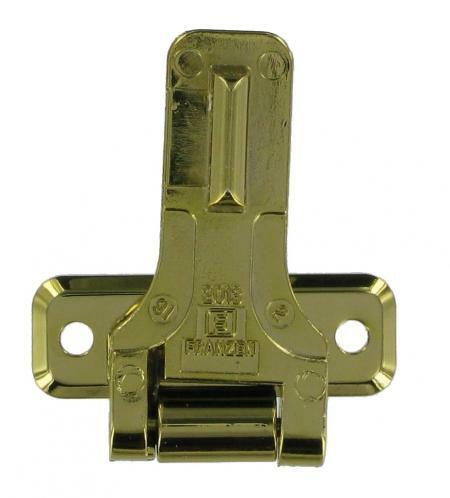 This large Brass Franzen lock is the current model and has superseded all the other Franzen combination locks on this website. This is a widely used lock and the dimensions are as follows: Length:65mm Width:33mm Hole Centres:57mm x 25mm You will also find below the appropriate hasps and rivets to go with this lock (if required). If you have any queries about the suitability of this luggage spare, please call +44 1494 775577 and ask to speak to Paul.